The World Health Organization (WHO) has declared the spread of mosquito-borne Zika virus a global public health emergency. On Monday, the global health agency held an emergency meeting in Geneva after warning the public that Zika is spreading "explosively" across the Americas. Last week, health officials confirmed one case of the virus in Denmark, five in Great Britain, three cases in the United States and 18 in its territory of Puerto Rico. The global health organization also predicts that Zika could infect as many as 4 million people in the Americas this year. The symptoms from the virus are minor. The symptoms are flu-like and include a rash. But the results for some infected with Zika -- namely pregnant women -- are devastating. The WHO suspects the virus may be linked to brain disorders in babies. Health experts highly suspect there may be a link between the illness and microcephaly. Microcephaly is a birth defect in which babies are born with very small heads and underdeveloped brains. However, a definite link between Zika and microcephaly has not been proven. World Health Organization spokesman Gregory Hartl has this to say: "So, one of the curiosities is why we have so many neurological cases in say the northeast of Brazil, but we have not had it in other places. So, we really need to understand what is existing that causes these microcephaly cases, for example, in children." Mothers with their children, who have microcephaly, await medical care at the Hospital Oswaldo Cruz, in Recife, Brazil, Jan. 26, 2016. The last time the WHO declared a public health emergency was for the Ebola outbreak in 2014. The global health agency was criticized at the time for its slow response and the outbreak killed more than 11,000 people. Hartl does not agree with claims that the Zika virus could pose a threat similar to that of Ebola. He says that Ebola is transmitted by contact with bodily fluids from person to person and kills about 50 percent of its victims. "Zika has never killed a person and it is transmitted by the mosquito. So, we know that there are those two fundamental differences at least. Let us say that Zika on its own would not be the consideration of an emergency committee. What is the concern to the international community is the possible link with neurological disorders." There is currently no treatment or vaccine for Zika. Anthony Fauci is director of the National Institute for Allergy and Infectious Diseases (NIAID). He says it would take "a few years" before a vaccine is readily available to the public. Fauci says what other public health experts are saying – for now, the way to fight the disease is "mosquito control." 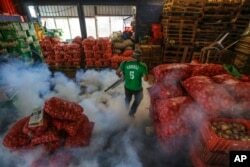 In this Jan. 28, 2016 photo, a Health Ministry worker in Managua, Nicaragua sprays chemicals to kill mosquitoes that transmit the Zika virus..
Mosquito control means killing the eggs and larvae and cleaning up standing water where mosquitoes may breed. This means wearing long-sleeved pants and shirts, sleeping with mosquito nets and using mosquito repellent. The Zika virus gets its name from a forest in Uganda where the virus was first identified in 1947. The virus is known to exist in tropical areas like Africa, the Americas, Southern Asia and Western Pacific. People can catch the Zika virus after being bitten by an infected Aedes aegypti mosquito. This is the same mosquito that can spread dengue, chikungunya and yellow fever. The U.S. Centers for Disease Control says that Brazil reported its first case of Zika virus in May 2015. Since then, the virus has spread by mosquitoes and has caused infections in Brazil and many other countries in Latin America. The WHO also says Zika has been more common in Southeast Asia than the few cases reported in the region in the past several years. However, the WHO regional office in Southeast Asia says there has also been no link so far between Zika and microcephaly in Southeast Asia. Malaysian and Singaporean public health officials have warned of a high risk of contagion if the virus is introduced there. The Philippines health department is calling Zika a "real and present" risk. They add that warmer, wet weather will likely lead to ideal conditions for mosquitoes to breed. Anna Matteo wrote this story for Learning English based on VOA News reports. Hai Do was the editor.